Hope you all had a wonderful weekend! Yesterday I went over to my parent's house to help my mom while learning how to make arroz con pollo myself! I shared our time on Instagram stories and many of you asked to share the recipe! 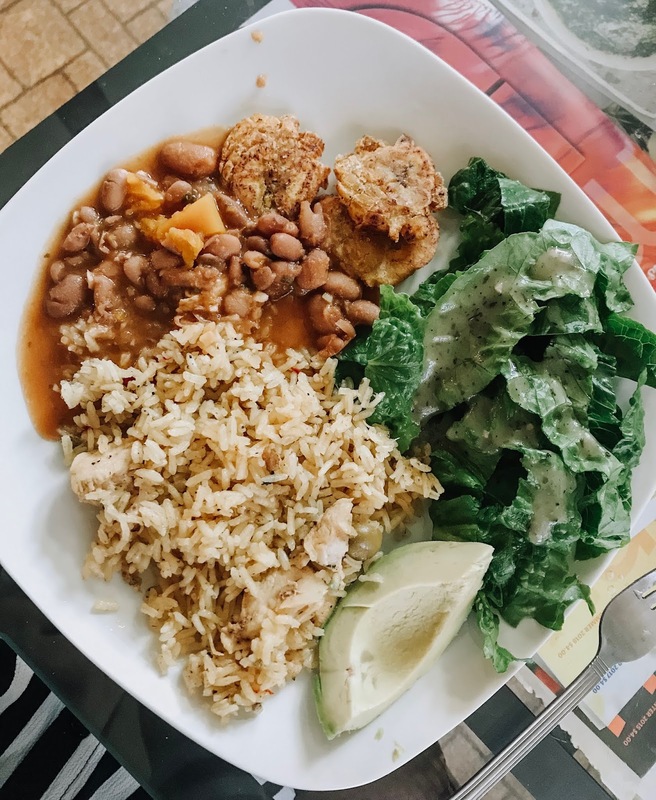 I am so happy to share the recipe with you guys and if you end up making arroz con pollo please tag me or let me know! My mom would be so happy to see your results! Cut your chicken into your desired pieces. In a bowl season generously the pieces with ground cumin, pepper and salt. Make sure to evenly coat every piece, then set aside. Next heat your caldero or a heavy bottom pan over medium heat. Add in olive oil and then your sofrito. Let cook for a few minutes. Add in your chicken pieces and tomato paste. Let cook for a few minutes longer. Then add your red peppers and green olives and about a cup of water. Put the lid on your pot and let cook until you see the chicken cook through. Once your chicken is cooked you want to add in your rice. Follow the instructions on the back of your rice bag when it comes to the amount of water is needed. Allow everything to cook for about 25 minutes. Keep watch of it though! Once all the liquid has been absorbed lower the heat to low, move your rice and chicken around and continue to cook for about 12-15 minutes. Again the timing is different on a various of factors so keep watch of it and taste test the rice. Once cooked don't forget to garnish with a side of avocado slice! You can eat this meal with habichuelas guisada and tostones like my mom made. Sorry that this recipe is not specific but my mom eye balls a lot of her steps so I did the best I could to break it down for you guys. There are a lot of wonderful youtube videos of arroz con pollo you can follow as well! Thank you guys for all the love you guys sent my mom and we look forward to next sunday videos!